Today looks like it will be another beautiful day. The sun is coming up and shining through the front window. It is nice to have warmer weather. Of course we never get really cold, only California Cold. That means temperatures in the 40's. I have received positive responses on the computer table. I guess a few people like this table. Today I will drill a hole in mine and install a screw so I can keep it from rotating when I have a heavier load on it. I mentioned this in the article in the RV Living Magazine pages. I will also look in anchoring the table today so there is no chance of it "flying" around as we drive or STOP! Here is the horseshoe rope hook I will use as my tie down. 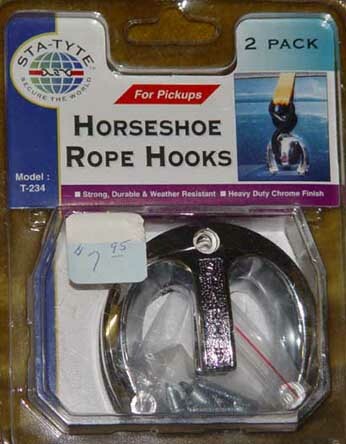 At first I was going to buy a big ugly eye hook, but I was at the RV store and found these nice looking rope hooks. There are two in the package. I paid $7.95 for these two. Last night we signed up for another RV.net rally. This one is at Shaver Lake in California. That is east of Fresno. RV.net rallies are just friends who met in the RV.net Forums and decided to get together for a weekend of camping and fun. There may be from 10 to 50 rigs at a typical rally. There is no organization sponsoring these events. They come about because people are on a RV forum on the internet and decide to meet somewhere. There are no dues. There are no meetings. There is no monthly schedule. RV.net rallies are just people with RV's getting together. Sharon and I have been to 4 rallies in the year we have owned our motorhome. Including the one this coming Friday we are scheduled to attend 4 more this year. The rallies we attend are from 2 to 6 hours from home.